I’ve started to explore the Impulse! label for real. I’ve bought a couple of titles. There’s a lot of wonderful albums to discover, as well as musicians you haven’t heard before. The type of jazz released on this label comes with great variety, which makes it interesting and you’ll discover new or/and different flavors with each release. I’m intrigued with what I’ve heard thus far and I will continue to explore the label with great excitement. I will of course seek out all the Coltrane albums but there is so much more to sink your teeth in. I’ve fallen in love with the rhythm section of Elvin Jones and Jimmy Garrison. Elvin Jones is just phenomenal. I love his style, touch and sound. So the LP on display here is right up my alley. It’s a very diverse album with a nice blend of tunes. The personnel are Elvin Jones on drums, Jimmy Garrison on double bass, McCoy Tyner on piano, Sonny Simmons on alto sax and English horn, Charles Davis on baritone sax and Prince Lasha on clarinet and flute. Three of the cats I haven’t heard before, and it is interesting to soak in their different styles, especially when they deliver some stuff on instruments I do not often listen to; like the english horn, clarinet and flute. They all sound great. Highly recommended. I love the packaging of these old Impulse! releases. The beautiful, heavy gatefold covers with the images and liner notes inside are oustanding. The iconic orange and black labels. I have a white label promo copy of this LP and those labels are very cool as well. The sound of the vinyl is brilliant. One of the best sounding records I’ve heard. It sounds so organic and powerful. Couldn’t ask for more. I would urge anyone who hasn’t delved into the Impulse! catalogue yet to do so. I think you will find many great and interesting titles. And if you’re looking for 1st pressings they won’t cost you a bloody fortune. Much more reasonable prices. How about you guys, what’s your take on the Impulse! label and do you have some favorite titles you’d like to share? Vacation time will soon be here and I look forward to that immensely. To get some warm sun on my face cause here in Stockholm the sun has forsaken us. I hope you will have a nice Sunday and enjoy some jazz. Stay tuned for more great albums from the collection. Cheers! 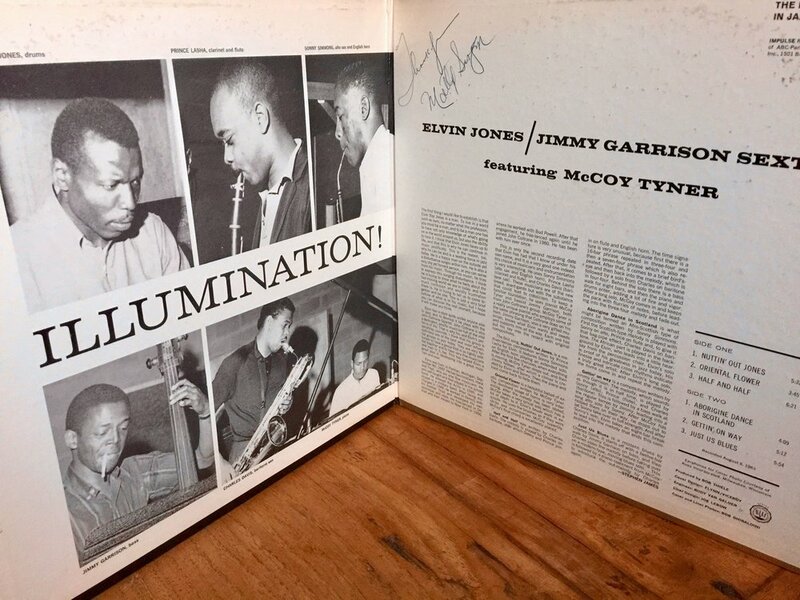 tagged with A-49, Elvin Jones, Illumination!, Jimmy Garrison, Impulse!